Art, for me, means connecting with the landscape of the heart in a most intimate way. Touching brush to paint to canvas, I express my admiration for each delicate shadow, blade of grass, flicker of light. The ephemeral nature of reality makes the world and my place in it all the more precious. When I slow down and see things clearly, I discover a space within my own heart/mind that is luminous and bright. My painting is an expression of our deepest human longing to reconnect with the light and spaciousness of our own true nature. Meeting the landscape face-to-face means coming home. In recent years, I’ve had the opportunity to experience the vast Nevada landscape one step at a time. Hiking in wilderness locations challenges me to be mindful of the stark beauty and the silence. Mostly I just listen, but sometimes, when the lighting is just right, I take photos, which I later translate into painting. 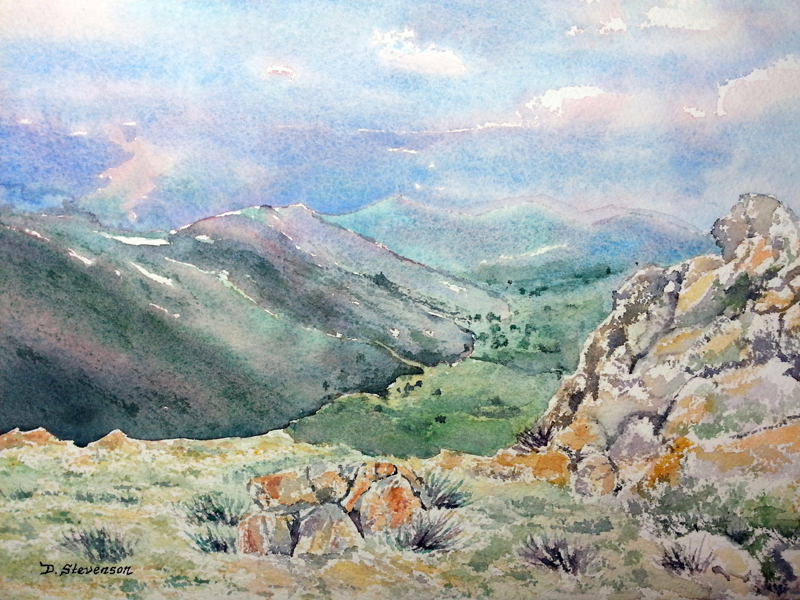 My genre is naturalism and I work primarily in watercolor and acrylics. I layer colors to express light and vibrancy—the life force that flows through and connects all things. 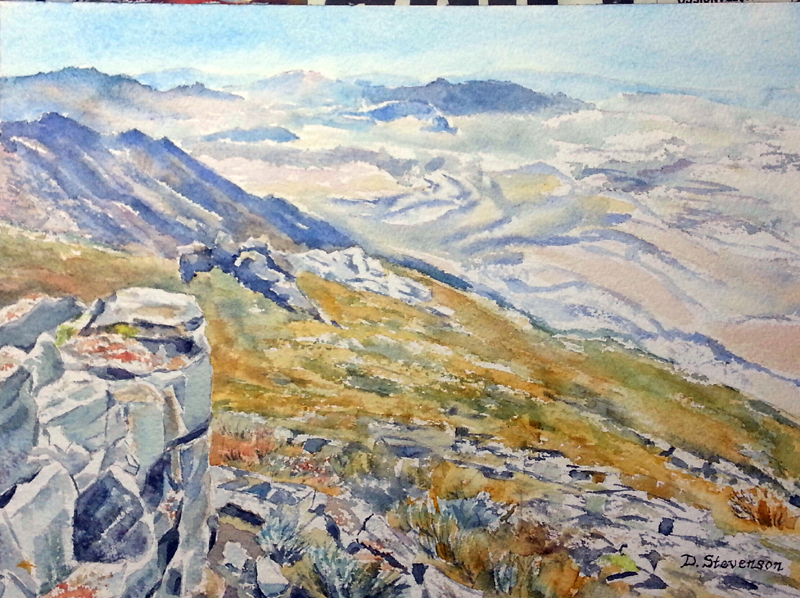 My painting Arc Dome, was inspired by the opportunity to ascend the 11,773’ summit with two friends in the month of August. Arc Dome Wilderness is remarkably lush. After camping near Stewart Creek, we meandered through aspen forests carpeted with tall grass and wildflowers. High above, huge thunderheads gathered and dispersed. The mountain itself is stark and imposing. Solid. Steadfast. Imperturbable. I chose to keep the foreground simple. My focus was the interplay of light and shadow, peak and sky. Wild Nevada at its best. Deborah Stevenson earned her B.A. in Fine Arts from Adams State College in Alamosa, CO and Masters in Anthropology from the University of Alaska, Fairbanks. She has always been inspired by nature and sold her first painting at the age of 17. With over 45 years of experience, her style is mature and deeply spiritual. 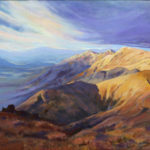 Having been strongly influenced by the writing of Aldo Leopold, her art expresses a land ethic, bordering on reverence. She is originally from Colorado and moved to Nevada in 2004. 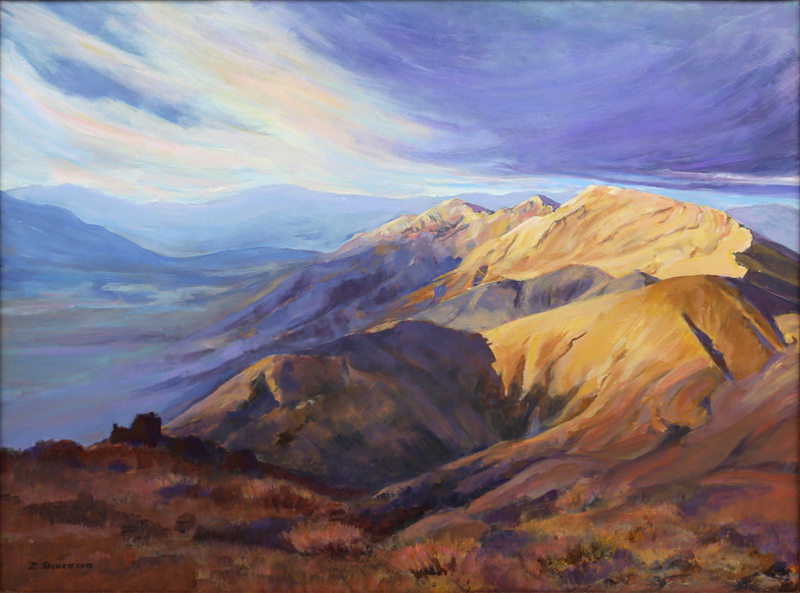 Stevenson’s painting Into the Light won 1st Place in Acrylics and People’s Choice at the Sesquicentennial Nevada Day Show of the Nevada Artists Association at the Brewery Arts Center in Carson City (2014). 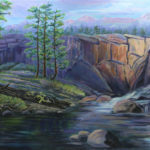 She has exhibited in Guatemala, Italy, Germany, Alaska, and throughout the lower 48, where many of her award-winning paintings are in private collections. 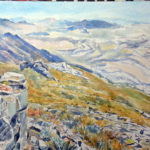 Stevenson recently retired after 12 years as Curator of Education at the Nevada State Museum in Carson City in order to pursue hiking, art, and spiritual interests. Previously, she worked for 10 years at Edge of the Cedars State Park Museum in Blanding, Utah, where her contact with Native American tribes deepened her respect for the landscape. 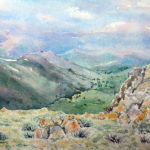 She is a member of Friends of Nevada Wilderness, Toiyabe Chapter of the Sierra Club, Mono Lake Committee, and Audubon Society, plus Nevada Artists Association, Brewery Arts Center, and Capital City Arts Initiative.